PNC Park is the site of the matchup between the Milwaukee Brewers and the Pittsburgh Pirates on Wednesday, September 20, 2017. The probable starting pitchers are Matt Garza for the Brewers and Steven Brault for the Pirates. Milwaukee opens at -133 while Pittsburgh opens at +123. The Brewers have a 65-78-7 over/under record and a 81-69-0 run line mark. The Pirates are 77-74-0 against the run line and have a 59-87-5 over/under record. The Brewers have a 80-70 overall record this season. Starting pitcher Matt Garza has a 6-9 record with an earned run average of 4.99 and a WHIP of 1.46. He has 78 strikeouts over his 113.2 innings pitched and he's given up 121 hits. He allows 9.6 hits per 9 innings and he has a FIP of 4.94. The bullpen has an earned run average of 3.87 and they have given up 473 base hits on the year. Teams are hitting .239 against the bullpen and they've struck out 562 hitters and walked 246 batters. As a team, Milwaukee allows 8.6 hits per nine innings while striking out 8.4 batters per nine innings. They are 8th in the league in team earned run average at 3.99. The Brewers pitchers collectively have given up 1,282 base hits and 593 earned runs. They have allowed 172 home runs this season, ranking them 25th in the league. Milwaukee as a pitching staff has walked 514 batters and struck out 1,249. They have walked 3.5 men per 9 innings while striking out 8.4 per 9. They have a team WHIP of 1.34 and their FIP as a unit is 4.25. As a team Milwaukee is hitting .250, good for 21st in the league. 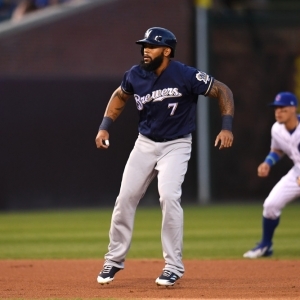 The Brewers hold a .433 team slugging percentage and an on-base percentage of .322, which is good for 18th in baseball. They rank 22nd in MLB with 8.4 hits per game. Domingo Santana is hitting .277 with an on-base percentage of .371. He has 135 hits this season in 487 at bats with 77 runs batted in. He has a slugging percentage of .487 and an OPS+ of 122. Orlando Arcia is hitting .271 this year and he has an on-base percentage of .320. He has totaled 129 hits and he has driven in 48 men in 476 at bats. His OPS+ is 88 while his slugging percentage is at .403. The Brewers have 1,266 hits, including 250 doubles and 211 home runs. Milwaukee has walked 499 times so far this season and they have struck out 1,462 times as a unit. They have left 1,001 men on base and have a team OPS of .755. They score 4.59 runs per contest and have scored a total of 688 runs this year. Pittsburgh has a 68-83 overall mark this year. With an earned run average of 4.38, Steven Brault has a 1-0 record and a 1.54 WHIP. He has 15 strikeouts over the 24.2 innings he's pitched. He's also given up 29 hits. He allows 10.6 hits per nine innings and his FIP stands at 3.28. The bullpen has an earned run average of 3.94 and they have given up 482 base hits on the year. Teams are hitting .247 against the Pirates bullpen. Their relievers have struck out 459 batters and walked 186 opposing hitters. As a team, Pittsburgh allows 9.2 hits per nine innings while striking out 7.9 batters per nine innings. They are 13th in the league in team earned run average at 4.29. The Pirates pitchers as a team have surrendered 1,369 base knocks and 640 earned runs this season. They have given up 171 home runs this year, which ranks 26th in Major League Baseball. Pittsburgh as a staff has walked 465 hitters and struck out 1,175 batters. They give up a walk 3.1 times per 9 innings while they strike out 7.9 per 9. Their team WHIP is 1.37 while their FIP as a staff is 4.22. As a team, they are batting .243, good for 28th in the league. The Pirates hold a .385 team slugging percentage and an on-base percentage of .318, which is good for 21st in baseball. They rank 28th in MLB with 8.2 hits per contest. Josh Bell comes into this matchup batting .256 with an OBP of .334. He has 131 hits this year along with 83 RBI in 512 AB's. He maintains a slugging percentage of .469 with an OPS+ of 108. Andrew McCutchen is hitting .277 this season and he has an OBP of .362. He has collected 148 hits in 534 at bats while driving in 79 runs. He has an OPS+ of 119 and a slugging percentage of .479. The Pirates as a unit have 1,241 base hits, including 232 doubles and 143 homers. Pittsburgh has walked 485 times this year and they have struck out on 1,128 occasions. They have had 1,067 men left on base and have an OPS of .703. They have scored 4.03 runs per game and totaled 609 runs this season.